(NaturalNews) It's not often that I ask for your help. But today, I need your help and your action to send an unforgettable message to Big Food that says, "We demand food transparency, honest ingredients and clean food!" How can you send that powerful message to Big Food? I've just released my first book through traditional publishing channels. 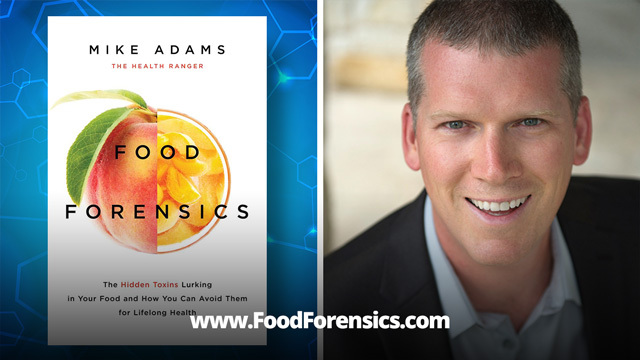 It's called "Food Forensics" and it's launching July 26th through all the major book reseller channels like Amazon.com, BN.com and brick-and-mortar book retailers. Even in its current preorder stage with very little publicity, this book has already achieved #1 on Amazon.com for the best new release in its category. But that's not enough. To really send a message to Big Food and help make history through independent science and grassroots demands for food transparency, we need to make this book #1 on Amazon.com as it launches. That's why I need your help -- and it's a rare request coming from me, you know -- to put this book into the top sales lists on Amazon.com, BN.com and book retailers. Click here to get the book on Amazon.com or click here to get it from Barnes & Noble. Remember, this isn't a BOOK... it's a MOVEMENT! When you support my work through this book, you are part of a global revolution in food transparency, honest labeling and grassroots clean food activism. This isn't about earning money from selling a book. It cost me far more in laboratory instruments and consumable lab supplies than I will ever earn from this book. And since both Amazon.com and BN.com heavily discount all new books today, there's relatively little profit for publishers or authors these days. I knew from day one that this book was never about earning any dollars. It had a much more important mission: To expose the lies of Big Food and reveal the truth about all the chemicals and heavy metals they're shoving down your throat. That's why today, I'm asking you to "vote" for my book in the only way votes really count in the commercial marketplace: by purchasing it. When you buy Food Forensics, Amazon.com takes notice. With enough sales, we might even make the New York Times bestseller list. And even more importantly, if this book does well enough for the publisher (BenBella books), they will likely commit to a second, follow-up book that publishes test results for pesticides, herbicides and hormone disrupting chemicals! Truly, the best way to support my ongoing lab work in exposing these heavy metals and chemicals in foods is to support this book. And remember that most of the mainstream media will censor this book and refuse to plug it because they're largely supported by toxic food companies and pharmaceutical manufacturers -- the very corporations I expose in this extraordinary compilation of scientific research! Together, we're all part of a global food rebellion against deceptive agricultural poisoners and unethical food giants. We the People now have the means to fight back against dishonest food labels, hidden toxins and unsafe heavy metals lurking in our foods. If you're tired of being poisoned by Monsanto, lied to by PepsiCo, tricked by General Mills or deceived by "all natural" foods that are loaded with toxic chemicals, this is your opportunity to send an unforgettable message to Big Food. What does that message say? That they must clean up their foods or be EXPOSED by independent scientists they cannot influence, corrupt or control. The food giants already know they can control the mainstream media by threatening to pull their advertising. But when this groundbreaking book slaps them across the face -- (that's a metaphor, please don't physically assault anyone with my book) -- they will quickly realize that the Health Ranger's Food Forensics books cannot be suppressed or silenced... and that more books may soon follow to reveal testing of off-the-shelf products while exposing those products that are grown, harvested or processed with toxic substances. You can help send that message right now by preordering Food Forensics from Amazon.com or Barnes & Noble. Buy more than one copy if you have a friend or family member who can benefit from this breakthrough knowledge. Every copy that's purchased helps send a powerful message to Big Food. As book sales climb up the charts at Amazon.com, they will take notice! And together, we will demonstrate the extraordinary power of grassroots consumers who are sick and tired of being poisoned by food manufacturers who hide toxic chemicals and heavy metals in their products.